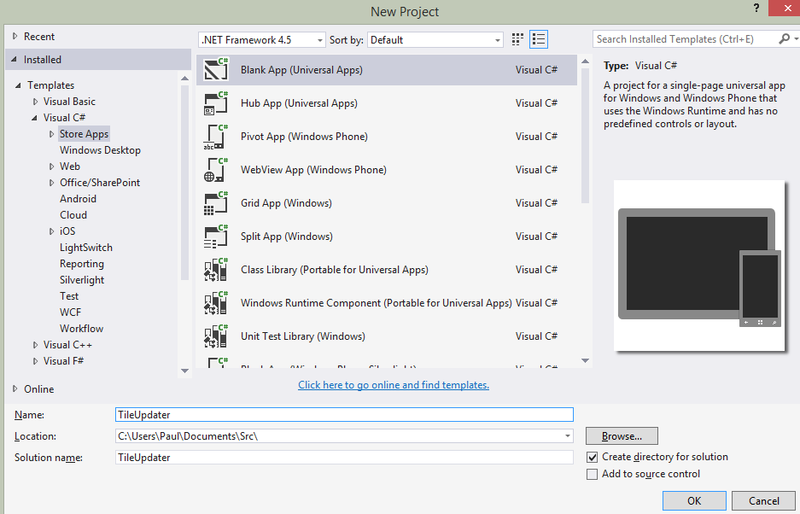 In Part 4 we finished with an MVVM app, running on both Windows 8 and Windows Phone. 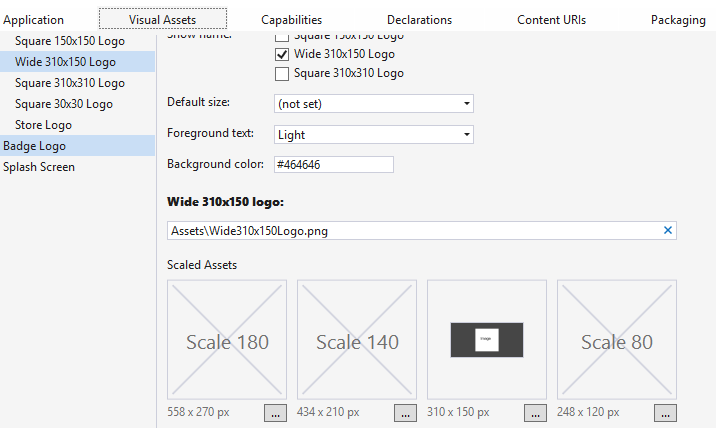 In this post I’m going to explore the idea of using the same XAML. The very short answer is probably “NO!”. The problem is that in anything but the most trivial of applications, the XAML will need to differ. In this application, it probably doesn’t matter, but then, it wouldn’t kill anyone to maintain two sets of very trivial XAML either. My approach to this, and to the above question is to create a custom user control, and then use that in both applications. The good thing about this is that it does make sense to share user controls (to me anyway). Other than the theme, they are the same. You could obviously just have MainPage in the shared project, but personally, I don’t believe that is extensible; if you do so, you run the risk of ending up with an overly complex XAML file trying to cater for each separate project type. Just a short post this time. In the next post on this, I’m going to add the missing functionality. This should be far easier now that the whole application is basically inside the shared project. 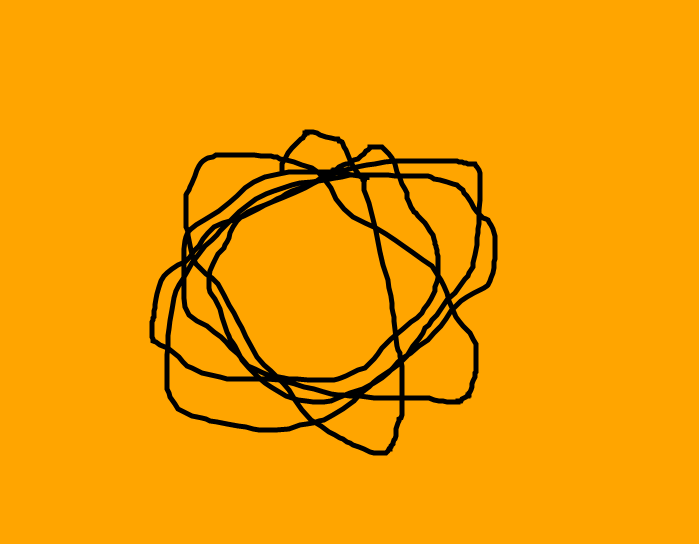 This entry was posted in C#, Windows 8, Windows Phone, XAML and tagged c#, MVVM, windows runtime, Windows Store Apps, WinRT, XAML on May 27, 2014 by pcmichaels. In the third part of my series on creating a universal app, I’m going to transfer the code that we created in part 2 and move it into a shared project. Did it just work – just like that? 1. The app will (again) not be pinned to the start screen, you’ll need to use the emulator to do so. 2. The tile will, again, initially be a small square (half the size of a wide tile – 150 x 150); this will need to be a wide tile, and to do so, you need to press and hold and the first reduce the size, before increasing to a wide tile. 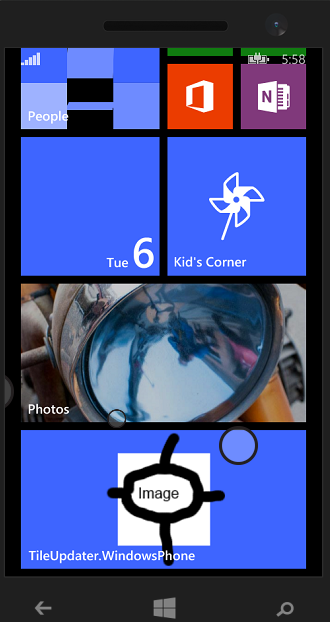 Okay – so, we now have a Windows Store and Phone App. 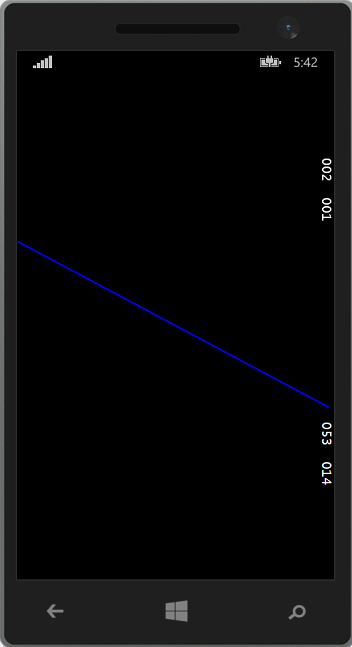 There’s a common codebase (admittedly it’s a bit scrappy), and the phone app took around 20 seconds. 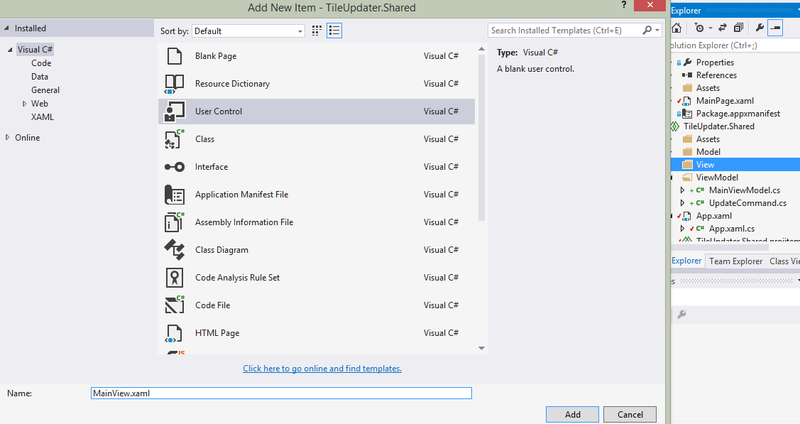 In the next post I’m going to tidy up the code and investigate options for using shared XAML. 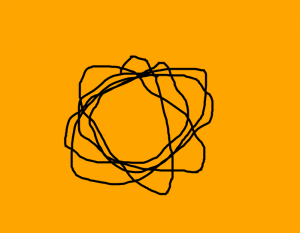 This entry was posted in C#, Windows 8, Windows Phone, Windows Store Apps, XAML and tagged c#, Universal Apps, Windows 8, Windows Store Apps, WinRT, XAML on May 13, 2014 by pcmichaels. In my first post of this series I looked at some considerations of designing a store / phone app. This post will cover the basics of creating a new Phone / Store app. I’m going to select a blank app, and create the project. What this gives me is a solution containing three separate projects. Next, create another tile image – just copy the first and change the text or draw something on it. Add this to your Windows 8.1 project, and call it test.png (place it under the Assets folder). Testing is further complicated because tiles are not automatically pinned to the start menu; so you may deploy and not see your tile. Even worse, I noticed a few times that despite the tile not being on the start screen, on searching for it, Windows claimed it was (so I had to un-pin and re-pin). 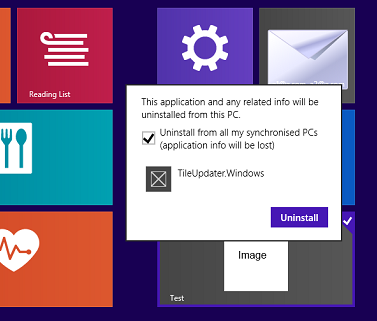 You now have a little program for Windows 8.1 that updates tiles based on a button click. In the next post, we’ll move this into the shared project and call it from the phone app, too. In later posts, I’ll change and refactor the architecture, too. 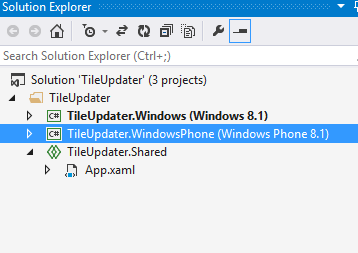 This entry was posted in C#, Windows 8, Windows Phone, Windows Store Apps, XAML and tagged c#, Cross Platform Development, Universal Apps, Windows 8, Windows Phone, WinRT, XAML on May 6, 2014 by pcmichaels.